What can the Bulls change up in Game 4? 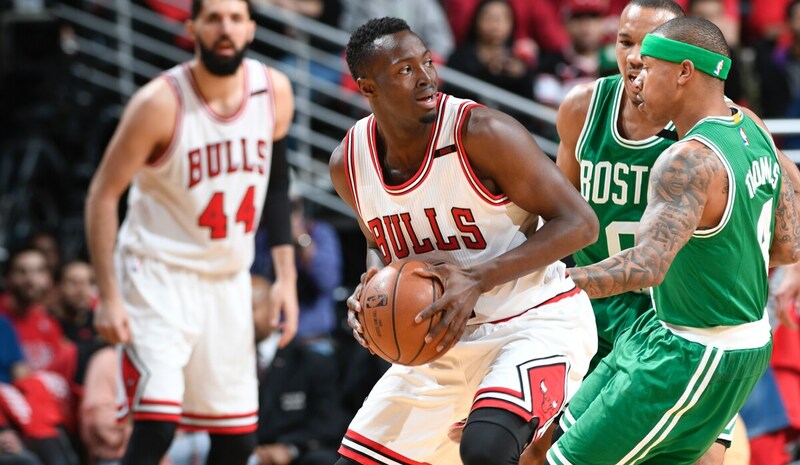 There are plenty of things the Bulls could do differently Sunday when they play likely what is the pivotal and most significant game of their season against the Boston Celtics in this first round playoff series. A loss would send the Bulls back to Boston not only 2-2, but having surrendered one of the great playoff advantages in NBA history, and then going against a confident and motivated Celtics team with two of three back home, where they were won 17 of their last 20 before the playoffs. "There's obviously a lot of things that we'll look to do tomorrow," Bulls coach Fred Hoiberg said at practice Saturday. "The biggest thing starts with effort. That first quarter, we got down 20 right away and obviously we have to do a lot to prevent that from happening. We'll look at everything. The biggest thing we were doing yesterday was taking the ball out of the net, and that just kills any opportunity you have for pace. Too much ball holding as was evident by our assist numbers, 14 for the game. And we were single digits for most of it. So we've got to get the ball moving better. Everyone's got to trust their teammates. That first game without (injured Rajon) Rondo, we had some things that didn't go as well as they had in the first two games. So you make some adjustments, watch the film like we did, and hopefully come out and play better." --- They could go to their strength, which also isn't generally their preference, which is throwing the ball inside to Robin Lopez. He's not Shaq, but not only do the Bulls have the physical rebounding and size advantage, but it seems the Celtics by going small with basically no center and four perimeter players have basically ceded the rebounding to the Bulls. They've said, in effect, they'd get their defense from the perimeter, and they did, Jimmy Butler with a historically poor playoff game with 14 points, zero assists and zero free throws. Avery Bradley appeared able to read Butler's underwear labels. The championship Bulls of the 1990s started every game throwing inside to Bill Cartwright and later Luc Longley. Not much after the first few possessions, but the idea was to get the defense reacting and thus opening outside space. The Bulls stunningly opened the game walking into contested jump shots, and then it was 33-15 Boston after one quarter. Plus, without Rondo's driving penetration, passing into the post would serve as penetration. ---- They could change the starting lineup. Jerian Grant, getting his first career playoff start, looked nervous and shaky. Michael Carter-Williams backing him up was a bit better defensively, but poorer offensively. Grant conceded Saturday he didn't play well and would more model himself after Rondo in Game 4. Hoiberg said no lineup changing decisions have been made yet, but he seemed to be leaning toward the same unit with perhaps a quick hook. Have Butler or Dwyane Wade handle the ball and add another wing shooter like Paul Zipser or Denzel Valentine? Hoiberg said the Bulls did try those looks on occasion during the game. But those combinations end up in the Bulls walking up the ball and frequent isolations. The Bulls averaged about five passes per possession in Games 1 and 2 with Rondo and about two passes per possession in Game 3. ---- Play Joffrey Lauvergne more for Cristiano Felicio. 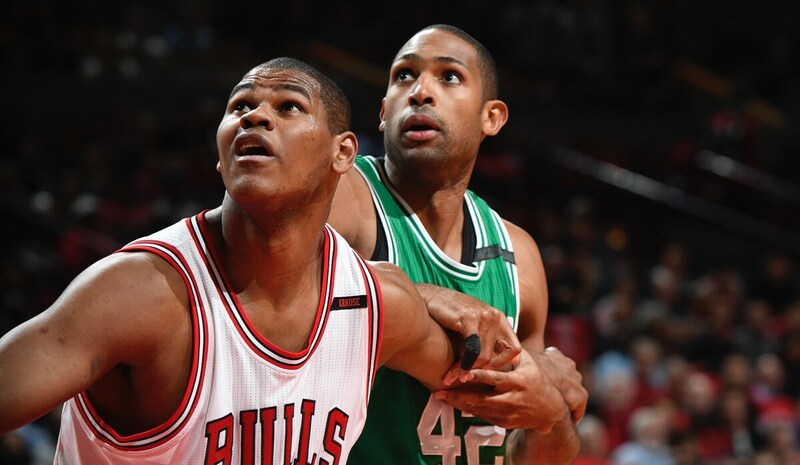 Felicio did well with 11 rebounds in 22 minutes, five offensive. But he is no offense threat. 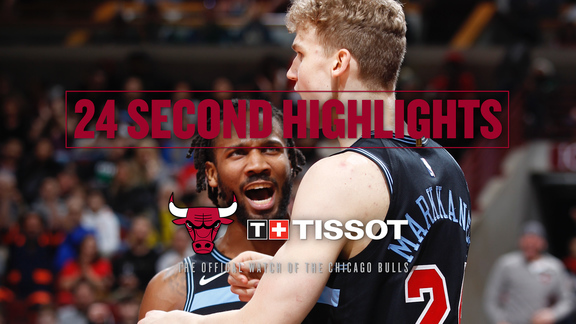 And as much as the Bulls after the game talked about defensive deficiencies, the offense was awfully offensive. Lauvergne worked with the starters often in practice leading up to the playoffs, but then Hoiberg went with Felicio. And to great advantage. Lauvergne could be quicker to match with Al Horford, who led Boston in scoring in Game 3. Lopez and Bobby Portis both played fewer than eight minutes in the second half. That certainly will change given Portis' major contribution in Game 1. ---- Reintroduce yourself to Nikola Mirotic. He got just seven shots, which obviously had to do with Rondo being out. Hardly anyone looked for him. Mirotic as a result even turned into an ocasional playmaker with three assists, which equaled the team high. No starter had an assist in the entire first quarter in a combined more than 45 minutes played. Even Hubie Brown on the national broadcast moaned, "What's with all the jump shots." There's all the usual cliché stuff of push the ball, stop taking it out of the net, swing the ball, close out on defense, help, rotate, guys step up. All good stuff, of course. But this is what this game comes down to: Your best player. Sure, it's a team game, and no one wins alone, but your best guy has to be the leader, has to give everyone else confidence in his play, his attitude, his demands, his insistence that he is not going to let you lose. Rondo actually filled that role in Boston even without much scoring threat. He was feisty and certain, attacking, trash talking, defiant. He did what he could from the bench Friday with a leg spasm as Jae Crowder danced off the court right in front of the sitting Bulls in extending the early lead to 18 points. The Bulls need the guys in the game, especially one guy, Butler. As great as Butler has been the last few years, this really is his first challenge, his first big moment as the leader of the team. The Bulls didn't make the playoffs last season when he emerged as the team's main option. The season before it still was Derrick Rose with that responsibility. When that big shot was needed in the second round near upset of the Cavs in 2015, it was Rose. Butler chafed; he was ready. He wanted it. Now it's time. 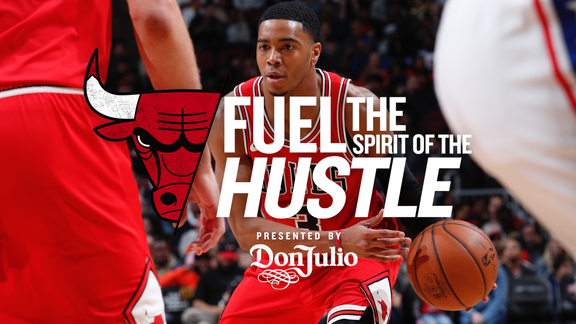 The Bulls need this one badly, and Butler is coming off a letdown performance. 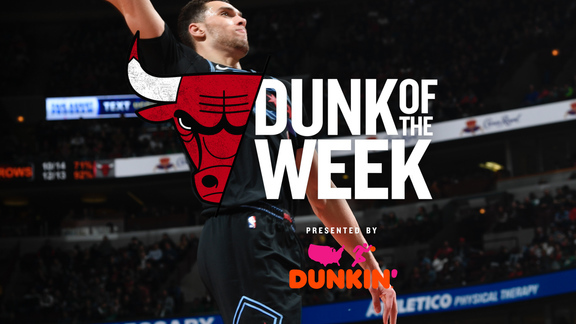 Did the Bulls follow him Friday to a casual start? That seemed a team decision. But when you have accomplished what Butler has, All-Star starter, all-defense, fourth quarter go-to scorer, Wade saying he is here to support Butler, then your teammates look to you. Anyone can have a bad game, and it's not like Butler pulled a Kobe from some years back and decided not to shoot. Butler shot up 21 of them, mostly off line. It happens. But now your teammates look to you for guidance, for inspiration, perhaps for a save. They're all pros, so they're all special. Some are more special than others. "You ain't gonna play great every night," Butler said at practice Saturday. "But I don't feel I changed the game defensively, either. I don't think I did too much of anything. It's all right. We play the way we're supposed to, I play the way I'm supposed to along with everybody else. And then it's back to, ‘The Bulls have a chance.' Go out and do that. Control that." Butler understands, but he also asked for this. He's earned it with his play we've seen so many times, but you have to earn it again in the playoffs when it matters even more. 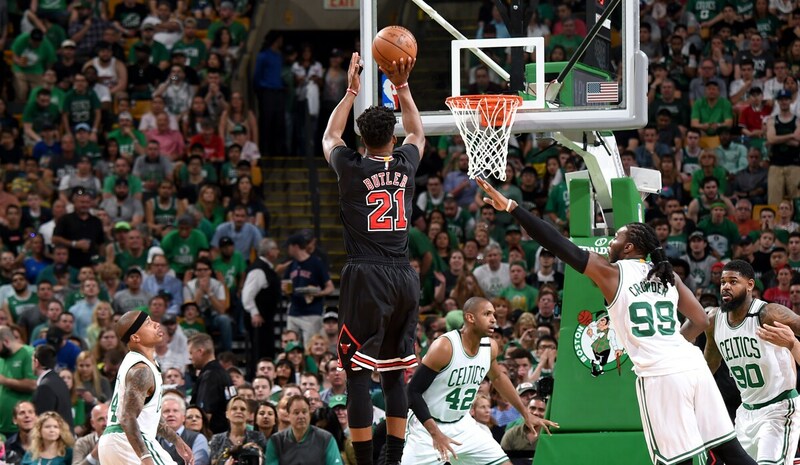 Butler seemed defensive about his lack of free throws, saying, "If I've got open shots, I've got to take them. You wouldn't say anything if I was...."
"Yeah, if I was making my jump shots," Butler finished. "It's not the fact I didn't get to the line. I still did all right. I'll continue to take what the game gives me, take jumpers if I'm open." It's not about what the game gives you, what the game tells you what shots to take. The great ones emerge and take their teams with them and tell the game what they are going to do. The Celtics defended much harder than the Bulls did, but Butler let Bradley pressure and push him around. Bradley's a good defender; so are Marcus Smart and Crowder. But none is an all-NBA player like Jimmy probably will be; none is an All-Star starter. You cannot let those players take away your game. The game is telling you to shoot jump shots because that's what they want you to do. Tell the game the heck with that! You don't take what the game gives you. You tell the game what you are taking from it! The dynamic also needs to change. Without Rondo, Butler and Wade tend to play with one another. They are close, and they are the two primary players remaining, and their specialties are scoring; no offense to Butler's defense. In Game 3, they combined to take 39 shots, 21 for Butler and 18 for Wade. No one else on the team attempted more than seven shots. Every starter for Boston attempted at least eight with four in double figures. Both Butler and Wade shot 33 percent. It's much easier to defend when the defense knows where the ball is going. And staying. It's also much more difficult to produce when you're not sure you may be getting another shot. Butler and Wade understand; they're not selfish. But they play a certain style. Rondo could overlap it with his one-man fast break. It's a lot to ask of Grant in now his second ever NBA playoff start, to push the ball and demand Butler and Wade catch up. "If I'm running, the guys are going to run with me," Grant said at practice. "They're not going to stand behind. So if I can get the rebound, get the outlet pass and make guys run the way Rondo did, that's something I can do." Maybe Paul Zipser can make some shots, Portis; maybe a Valentine sighting. That all would help, and even Wade after Game 2 declared himself a supporting actor in this drama. He was clear as well; it's Jimmy's show. Butler averaged 26 points, 8.5 rebounds and 5.5 assists in the two wins. He was terrific. But he also had Rondo taking on the booing of the crowd, confronting the Celtics, setting everyone up. It's continued with the tripping incident that really wasn't. Heck, the league should give Rondo a bonus for his hysterical deadpan explanation. Plus, hey, get out of the opponent bench! 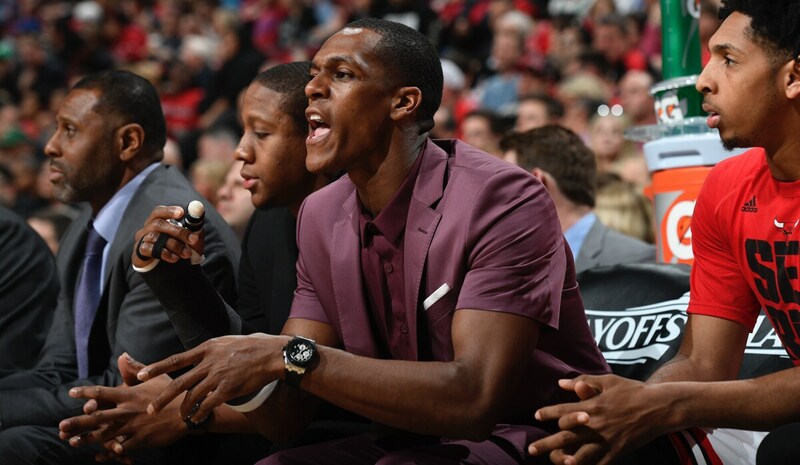 Though Butler Saturday said Rondo still can be an inspiration even when not playing. "I like confrontation, stuff like that," Butler said of the discussion of whether Rondo meant to trip Crowder. "Makes me smile. Gets me going and everybody else. I'm excited for what's next. I woke up smiling this morning. I don't like to lose. But I'm fortunate enough to wake up and still be able to play this game. That's just (Ron)Do for you. He's been through this before, countless times. He's won. He knows what he's doing. I just think overall we have to take his edge, especially mentally, older guys, younger guys, everybody. We have to think the game like he thinks it, study it the way that he studies it. Take note and take after him because he does everything the right way." And, no offense, not just be happy to have your health, you know waking up the luckiest man in the world. We all know. But this game may be the series. "We're telling each other we're still in control of the series. We're up 2-1 right now; we have another home game. So we're going to go out there and play our game." Sure, it's about winning, but winning doesn't determine who you are. It's competing; it's the desire and obligation. Plenty of guys who lost big games are winners. Don't ever mistake that. But this is Butler's time. This is when your team needs you most at the time when it's most difficult. Maybe the other guys don't do enough and it doesn't happen. It's OK.
"I'm not going to say we're going to lose," said Butler. "I don't think that's the right answer to any question. I don't think anybody plays this game to lose, especially this time of year. I feel we have a really good team. I'm taking our chances over theirs. I don't care how many games. We just have to get to four. We don't care who counts us out. We really don't care who wants us to win. We're worried about the people in here because we're the ones who have to do it every day." People always ask what leadership is about. It's about games like this, stepping forward to accept and endure the responsibility, raise the temperature on yourself so it can be lowered on everyone else. Get everyone involved so they feel a part of the quest, but make sure everyone sees that you're out front. That's what games like this are about. We can't wait.